The latest Leopard 1 kits are sadly lacking in the suspension department. These parts are not recommended for Takom as they have moulded-on components on the hull side. You will be giving yourself a lot of work. Meng's detail is basic, to say the least. Their shock absorbers are totally inaccurate, swing arms are very basic, return rollers are the wrong pattern, etc. The good old old Italeri/Revell kits are better in these respects, but can still be improved on. Hopefully this set is the answer. Fitting instructions are provided for Italeri/Revell and Meng. 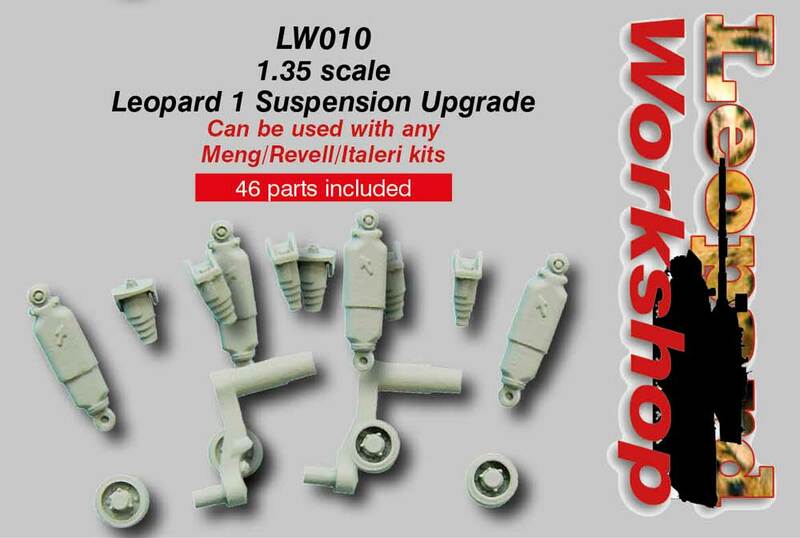 The swing arms are designed to fit any of the Leopard Workshop range of wheels, or Italeri/Revell kits. The axles are too narrow for Meng and Takom wheels. Drill holes directly above existing shock absorber holes (white dots). Remove collars and dimples. 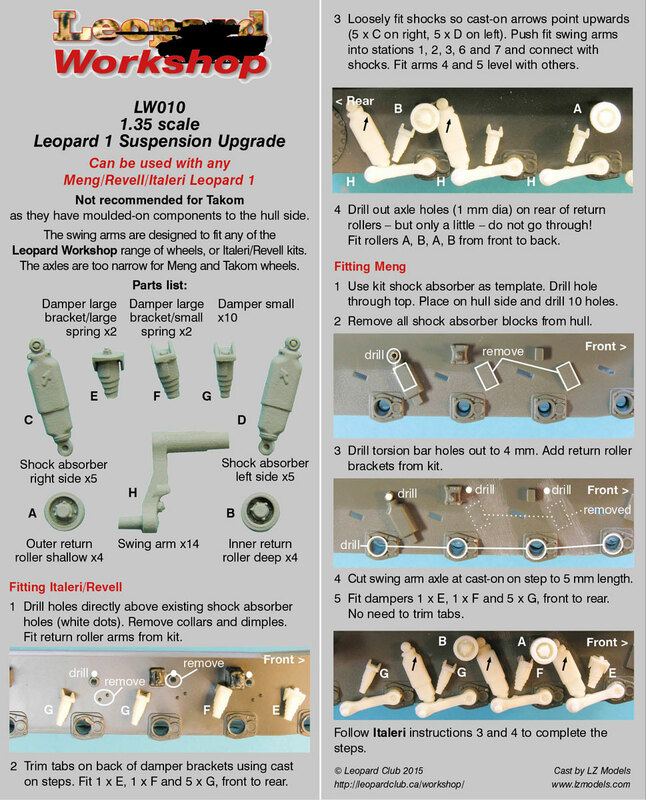 Fit return roller arms from kit. Trim tabs on back of damper brackets using cast on steps. Fit 1 x E, 1 x F and 5 x G, front to rear. Loosely fit shocks so cast-on arrows point upwards (5 x C on right, 5 x D on left). Push fit swing arms into stations 1, 2, 3, 6 and 7 and connect with shocks. Fit arms 4 and 5 level with others. Drill out axle holes (1 mm diameter) on rear of return rollers - but only a little - do not go through! Fit rollers A, B, A, B from front to back. Remove all five shock absorber blocks from hull. Drill torsion bar holes out to 4 mm. Do not drill first and last stations for now. Push fit the Revell swing arms/shock absorbers into stations 1 and 7. Cut swing arm inner axle down to 2 mm length (the part that goes through the hull). Fit arms 2 to 6 level with the kit arms. Remove the kit arms, and repeat 2, 3 and 4 above for stations 1 and 7, aligning them with arms 2-6. Break off the pins from the rear of the shocks. Fit the shock absorbers with the cast-on arrows point upwards. Locate onto pin on the back of the swing arm and fix at the angle of the carved off blocks. Fix bump stops E, F, G, G, G, G in this order - from front to back. The tabs will have to be trimmed smaller to fit holes in the hull. Drill out axle holes (1.6 mm dia) on rear of return rollers - but only a little - do not go through! Fit rollers A, B, A, B from front to back. Use kit shock absorber as template. Drill hole through top. Place on hull side and drill 10 holes. Remove all shock absorber blocks from hull. Drill torsion bar holes out to 4 mm. Add return roller brackets from kit. Cut swing arm axle at cast-on on step to 5 mm length. Fit dampers 1 x E, 1 x F and 5 x G, front to rear. No need to trim tabs. Follow Italeri instructions 3 and 4 to complete the steps. A review of this detail set by Kenneth Østergaard may be found posted on Armorama.